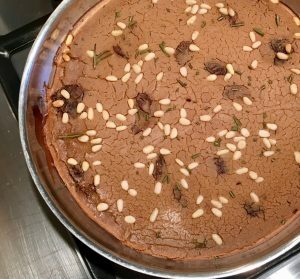 Castagnaccio or Chestnut Cake | Patrice Newell's online organic biodynamic Australian garlic and olive oil. My Favourite Winter Cake with Olive Oil, Fresh Chestnut flour and NO extra sugar! Soak the raisins and sweet wine and allow the raisins to plump for 10 minutes, then drain and drink the wine. In a large bowl combine chestnut flour, 2 tablespoons of the olive oil, raisins and 2 cups of the water. Whisk until smooth adding additional water as needed until the mix is wet like a pancake mix. Pour into the prepared tin and sprinkle the pine nuts and clipped rosemary on top. Drizzle with the remaining 4 tablespoons of olive oil and bake for about 45 minutes or until the cake is set and lightly browned on top. This almost has a pudding texture and you’ll note there is no sugar! It doesn’t need it because the chestnuts are so sweet but sometimes we drizzle honey over it too!